The Everly Brothers, Simon and Garfunkel, Peter and Gordon, and the Indigo Girls – All duos who effortlessly blended melodious vocals with upbeat instrumentation to create music still eagerly consumed today. What is it about good musical duos that is so attractive to the ears? One might say simply that good music is good music, but I believe it goes a bit further than that. Musical duos share a unique quality that other bands lack. Because of the limited power in numbers (2), paired musicians must completely rely on their partners for creative support. Thus, a symbiotic relationship develops that is evidenced in the music by the distinct vocalizations and the elegant use of melody. That said, there are not many musicians who can successfully fulfill the qualities of a successful music pair. The bands listed above are masters of the craft. Hannah & Maggie, a duo marked by strong harmonies and effervescent strings, is creeping up towards mastery. 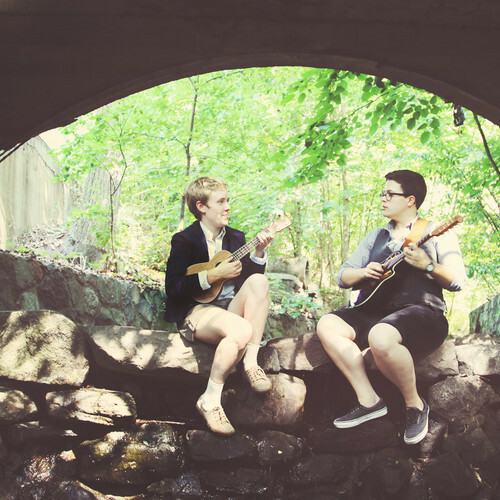 An acoustic folk duo, Hannah & Maggie are a dulcet amalgamation of tasteful arrangements and passionate, hard-line folk power performances, an eccentric mix of The Weepies and Mumford and Sons. It is this diverse style that truly sets the duo apart. Some folk groups are easily pigeon-holed into one specific style of the variegated folk genre, but clearly Hannah & Maggie do not have to worry about this limiting specification. In one word, the duo is refreshing. Each song represents a story and the tremendous harmonies fit like puzzle pieces in each song. Let’s take a listen to two songs off Hannah & Maggie’s latest release In The Company of Strangers, which came out this past February. “Morning Star” is of the Weepies variety, and it plays even more to this comparison because Hannah & Maggie create a toe-tapping, easy to sing-along to folk piece. The song moves like a tandem bike on a sticky summer day. It may be impossible to listen to this song and not smile. I challenge you to do this. This is the definition of folk easy listening – just a delicate piece that waves in the wind. “The Final Straw” is grittier. The guitar is choppier and the country whine is well-placed. The vocals are still competent and strong. For a New York duo, Hannah & Maggie sure do invoke a southern muse in this piece and do it as if they were natives. It’s fun. It’s exciting. It gets you moving. What else can you ask for? You can check out more about Hannah & Maggie at their website, Facebook, and Twitter.